In the tutorial Gas Furnace Types and Efficiency Ratings I describe the two main types of gas furnaces in the home, the conventional furnace and the newer high efficiency condensing furnace. The technologies used in these furnaces directly impact their AFUE efficiency rating. Only condensing furnace technology achieves the highest efficiency ratings of over 90% AFUE, with some furnaces reaching over 98% AFUE. 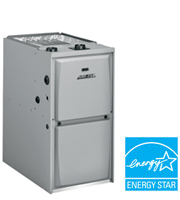 AFUE is an acronym for Annual Fuel Utilization Efficiency and is the metric used to measure furnace efficiency. It is simply a ratio between the amount of fuel converted to heat and the amount of fuel which enters the furnace. The higher the AFUE the more efficient the furnace. The condensing furnace is so efficient and extracts so much heat from the combustion process that its exhaust vent / flue is just warm to the touch, not “burn your fingers hot” like a conventional furnace. When your old furnace has reached the stage where it must be replaced you have a decision to make. You can install either a mid efficiency furnace(where this is legal) or you can pay more for a high efficiency furnace. There is no doubt that your fuel bills will be less with the high efficiency unit. The above discussion shows you what is entailed in a high efficiency furnace which may help with your decision. We feel that the lesser fuel costs combined with the lower atmospheric pollution level definitely justifies the higher cost. However this is a decision for the individual consumer to make. At our website you can obtain more information about gas furnace prices and about high efficiency furnaces. Nothing is more important in the winter time than heating your home. sometimes furnace repair just isnt enough. I have learned how important keeping and update and properly running heating system can be. It really will say you a lot in the end. I am quite happy with my new furnace!